With a six-hour stopover in Dubai as I made my way home from Doha to London, I decided that there was just enough time to head out to dinner in Dubai. The alternative would have been to spend six hours shopping at Dubai airport, an option that I considered rather dangerous. And besides, I prefer eating so much more than shopping. But the difficulty was – where to go?!?! There are just sooooooooooo many restaurants in Dubai! I ultimately ended up at Pierchic, a seafood restaurant that is one of the nine dining options in the luxurious Al Qasr, a hotel that is part of the glamorous Madinat Jumeriah Hotel Group. 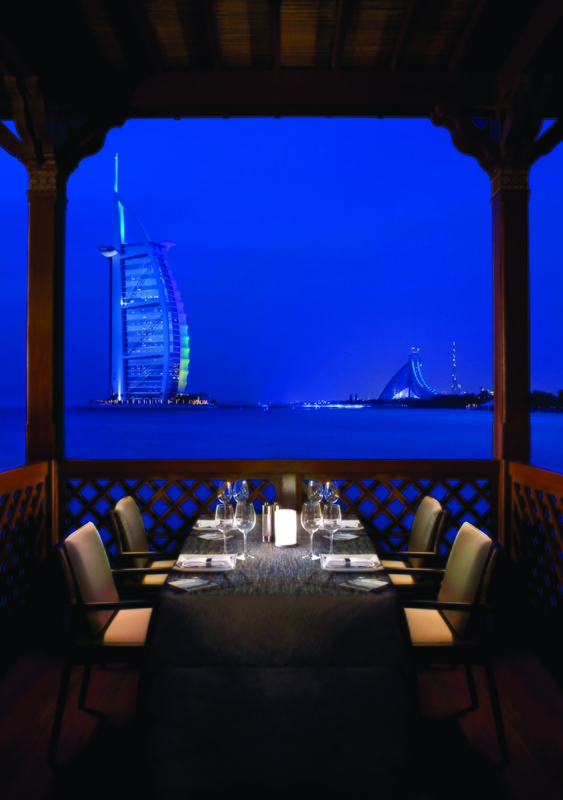 Pierchic has won a string of awards including Dubai Time Out’s Most Romantic Restaurant of 2013 and Best Seafood Restaurant of 2012. Pierchic sits on a jetty that stretches from the hotel’s edge onto the Persian Gulf. And with its position perched on the water it offers amazing views of its neighbour, the world famous seven-star Al Burj Arab Hotel which is also part of the Madinat Jumeriah Group. 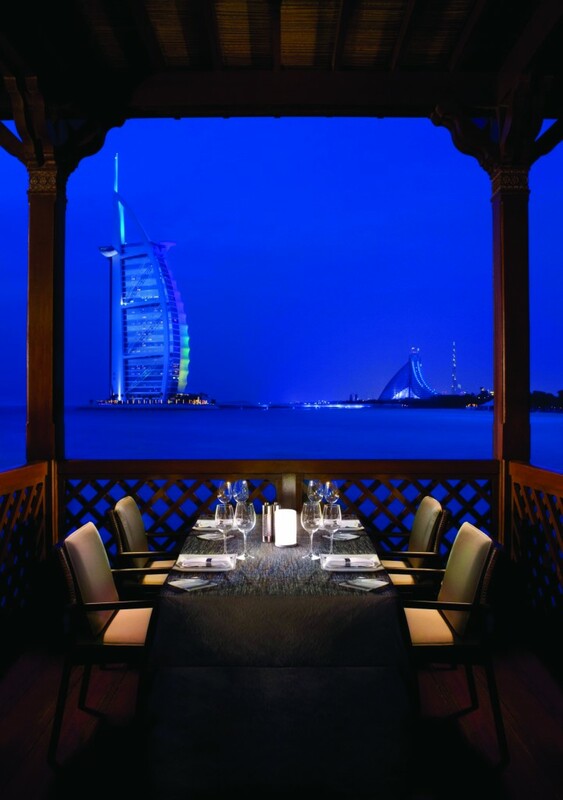 With views like this, it is easy to see how Pierchic can lay claim to being one of the most romantic restaurants in Dubai. Allegedly, the restaurant books out for Valentine’s Day six months in advance and has been the site of many a wedding proposal. Chef de Cuisine is Surrey-born Rosalind Parsk who trained at Westminster Kingsway College before moving to Marco Pierre White’s fine dining restaurant, The Belvedere in Holland Park, and then to The Grillroom in The Connaught Hotel in Mayfair with Angela Hartnett. Her move to Dubai came in 2007 when she was picked as part of the opening team for Gary Rhodes’ Dubai restaurant, Rhodes Mezzanine. That spell was followed by other assignments in Dubai before she was finally appointed as Chef de Cuisine of Pierchic in late 2012. Chef Parsk has continued in the seafood vein for which the restaurant became famous, and she has become something of a mini-celebrity in Dubai with cooking spots on Dubai TV. 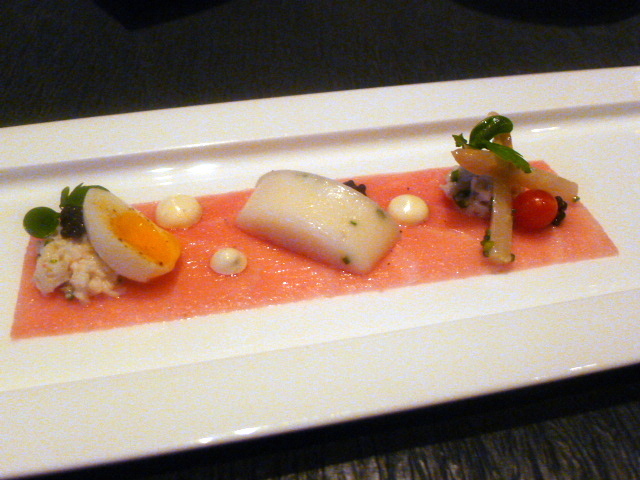 First of the starters was a yellow fin tuna carpaccio (AED150 – about £26.60) that was absolutely stunning. The tuna was intensely flavoursome, and there were lots of lovely textural contrasts from the accompanying crunchy white asparagus and the creaminess of the Norwegian king crab panna cotta. Rounding out the dish was some sturia caviar that provided a further dimension to the dish and a skilfully cooked soft quail egg with its lovely runny yolk. This dish showed incredible finesse. Fat and meaty pan-fried Loch Fyne scallops (AED165 – about £29) triumphed with precision cooking to display an opaque centre. It had also been seasoned wonderfully and came with delicious accompaniments of a “Sarrade” duck confit and ceps agnolotti, crispy duck bacon and a 26 month aged parmesan foam. 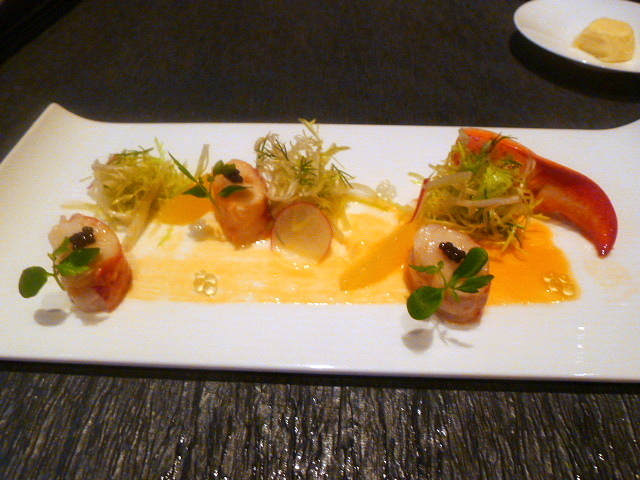 A poached Atlantic lobster (AED195 – about £35) was also beautifully cooked, succulent and moist. A shaved fennel salad was fresh with bits of bite and worked with the lobster nicely, and the lemon and pepper pearls gave the dish a gentle touch of acidity. Rounding off the dish was a beautiful orange glaze and some delectable sturia caviar. A main course of pan-fried halibut (AED240 – about £42.50) was perfectly seasoned and well cooked, although my personal preference is for fish to be slightly underdone so that it is moister. A wagyu short rib ravioli perched on top of the fish was cooked al dente and the slivers of salsify accompanying the fish provided a satisfying crunch. 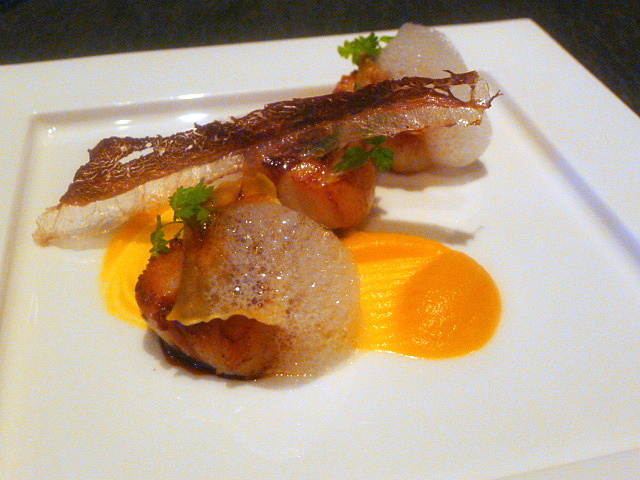 A shellfish foam and a thermidor sauce were pleasant and completed this dish. 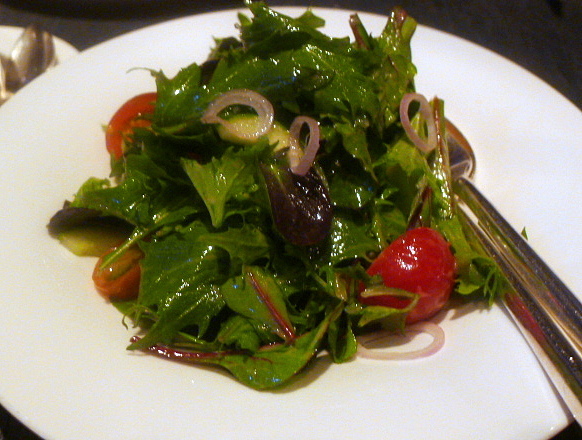 A side dish of cherry tomato, cucumber, red onion and parsley salad (AED30 – about £5.30) was fresh and well dressed, but unfortunately it was also over seasoned. 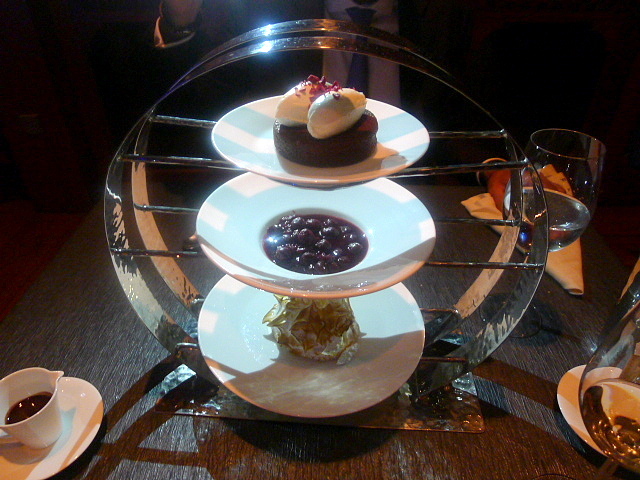 The dessert of a Black Forest Baked Alaska (which serves two) was a visual spectacle with its three-tiered presentation (AED110 – about £20). The bottom layer consisted of a soft meringue, the second layer was a dish of warm potted cherries, and the top was a manjari chocolate cake topped with some scrumptious whipped cream. Individually, everything tasted wonderful – the meringue with its luscious amarena cherry ice cream centre, the soft poached cherries with its contrasting sweetness and acidity, and the top layer with its rich chocolate-y goodness. But when eaten together, all the elements proved to be really fantastic, coming together harmoniously to taste like a glorious black forest cake. This dessert was perfect for sharing and would suit the many couples that visit Pierchic. 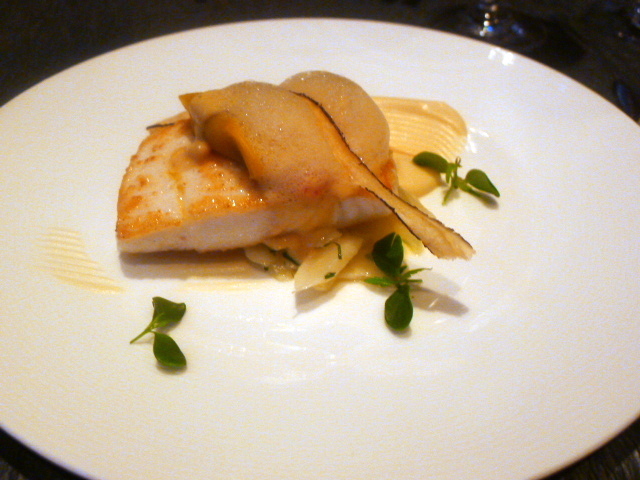 The food was extremely enjoyable with an elegance illuminating the dishes. Particularly impressive were the starters as they were as refined and complex as you might get in the one-star Michelin restaurants of Europe. The dessert was also admirable for its sense of fun and humour. The service was attentive and knowledgeable and designed to make the diner feel at ease. The restaurant is arranged spaciously with an intimte finish. Pierchic also has an outdoor terrace although the heat and the humidity of late June made staying indoors for dinner more preferable. It’s more difficult to get full sight of the gorgeous view when you’re inside, but there’s no doubt that during the more forgiving temperate months of December to February, al fresco dining at Pierchic would make for a perfect, romantic experience. For those who prefer to not eat seafood there is also a small selection of meat and vegetarian options at Pierchic. Prices: Three-courses from AED310 to AED990 (about £55 to £177), excludes drinks and service.